Il-2 Sturmovik: Tank Crew - Clash at Prokhorovka is an advanced simulator, set in the realities of World War II, that focuses on operating a tank. The game is a spin-off of the well-known series of aircraft simulators. 777 Studios and 1C are responsible for its creation. 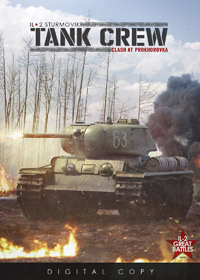 Il-2 Sturmovik: Tank Crew - Clash at Prokhorovka is a production enabling players to play the role of a tanker in the realities of World War II. The game is a spin-off of a well-known series of aircraft simulators. 777 Studios and 1C are responsible for the creation of this title. The Battle of Prokhorovka took place in July 1943 in the Soviet Union, 90 kilometres southeast of Kursk and was the largest armoured battle of World War II. The 5th Guardian Armoured Army launched an attack on the German SS II Armoured Corps. Although the Red Army's attack was stopped, it managed to achieve its strategic goal, which was to prevent the breakthrough of the third line of Soviet defence and thus to break the German offensive on the territory of the USSR. Il-2 Sturmovik: Tank Crew - Clash at Prokhorovka is an advanced simulator with a focus on driving a tank, embedded in the realities of World War II. Production enables battles to be fought in a faithfully reconstructed war theatre and offers a wide range of armoured vehicles known from the time of the conflict. The model of each tank has been prepared with care for the highest possible level of realism - both outside and inside. The machines available in the game are: T-34-76 STZ, KV-1s, M4A2, SU-122, SU-152, ZIS-5 + 72K, PzKpfw III Ausf.L, PzKpfw IV Ausf.G, PzKpfw V Ausf.D, PzKpfw VI Ausf.H1, Sd. Kfz. 184, Sd. Kfz. 10 + Flak38. This title also includes a large map of 100 km2 deposited in the title region of Pochorowka. Here you will find authentic, historical forests, towns and villages, including Pochorowka and Belgorod. This production has modes for both one and many players, and the latter also allows us to play in cooperation. Interestingly, in multiplayer mode Il-2 Sturmovik: Tank Crew – Clash at Prokhorovka requires more than one person to drive most tanks. Players are forced to work together to cope with something as trivial as movement – just like a real crew of an armoured vehicle. Il-2 Sturmovik: Tank Crew – Clash at Prokhorovka runs on the latest version of the Digital Warfare Engine, thanks to which it provides realistic, not out of step with modern standards graphic design. Expectations: 9.1 / 10 calculated out of 45 players' votes.